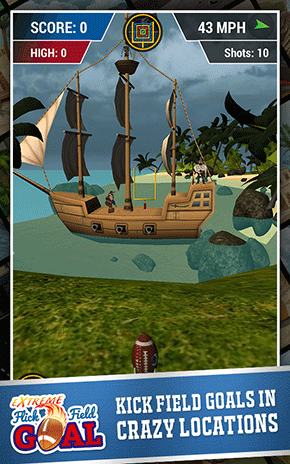 Much more than the standard 3D flick football field goal game! 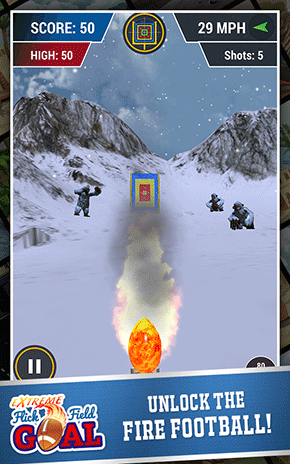 Extreme Flick Field Goal challenges you to kick field goals in exotic 3D locations around the world such as Moscow, tropical islands, deserts, canyons, oceans and more! Earn achievements for accuracy and successful flick kick streaks. 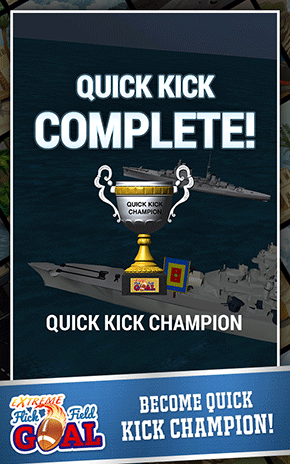 Once you are confident in your flick kicking ability, attempt to become a flick kicking app champion by completing the extremely difficult World Tour mode. Using your finger simply make an upward swipe from below the football toward the goal post. 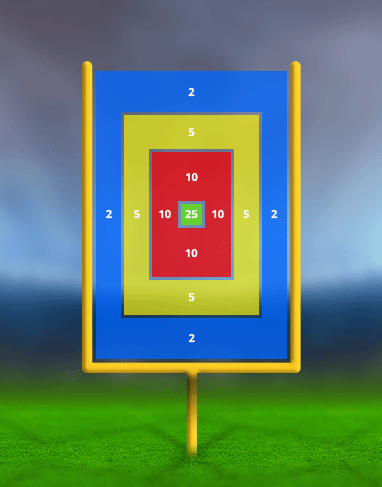 While the football is in the air swipe the screen in the direction in which you want the ball to travel. Be aware of the wind speed indicator in the upper right area of the screen as it will push the football in that direction. 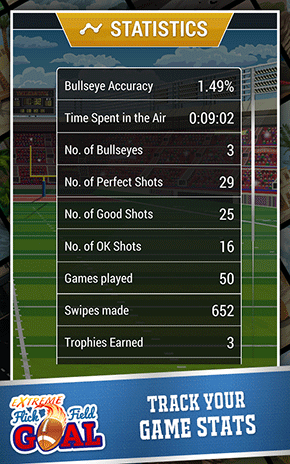 Press the circular grid icon on the top of the screen if you would like to overlay the scoring grid on the goal post. Points are achieved by the location where the football crosses within the crossbar. There are two game modes, Quick Kick and World Tour. 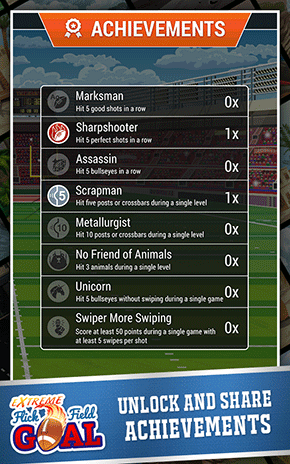 Press to clear all scoring history, user achievements, streaks, etc.. USE WITH CAUTION! Q: I purchased the World Tour In-app purchase but I still see Mystery where are my new levels? A: It's OK, the World Tour mode In-app purchase begins with 5 levels from Quick Tour and once you pass those you will unlock and play the 5 additional mystery levels. If you complete those you will earn the World Tour Champion achievement! Q. What is this icon for? A. 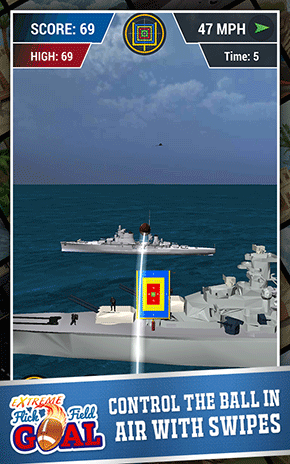 Pressing the grid icon toggles the in-game scoring grid on and off. Q. Can I hit the animals, people and monsters? A. Yes. In fact when you hit them they die! Q. What gameplay tips can you tell me? press the to save time and load your next shot. Q. 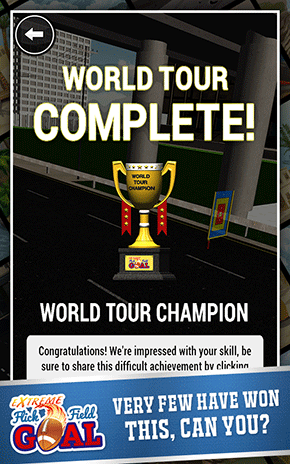 Has anyone earned the World Tour Champion trophy? A. Yes it has been done, though not too often. If you win this, definitely share it on Facebook! Q: What are the permissions for? A: First of all this app is not spyware, adware and will not do anything without your permission! The permissions needed and a description why are listed below. 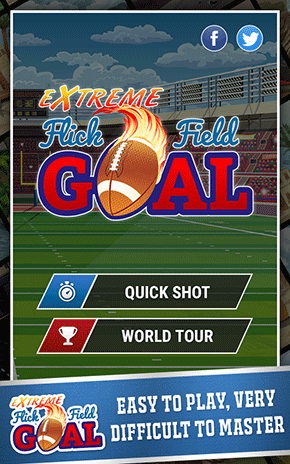 In-App Purchases Extreme Flick Field Goal is a free game but there is one IAP that offers 5 additional levels and the chance to earn the coveted World Tour Champion trophy and achievement. Q: Has anyone ever gotten the Unicorn achievement? A: No, this has not been accomplished yet by any player aside from one of our developers. 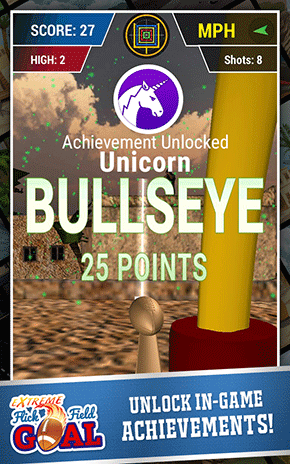 If you do earn the Extreme Flick Field Goal Unicorn achievement, please share it to our Facebook so you can be recognized! We are sorry to hear the app is not working properly on your device. Here are some steps you can try and of course you can always contact-us for help. We will get back to you within one business day. Of course if you'd like to speak to someone sooner, please call 480.563.0558. Thank you. Receive a free app quote today!